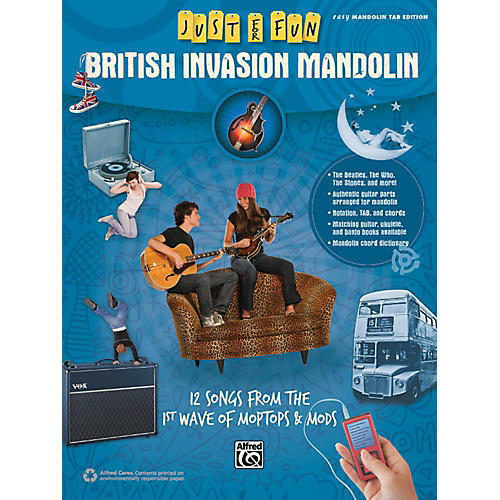 Just for Fun: British Invasion Mandolin is designed for your total enjoyment. Each featured song is arranged for banjo based on the original guitar parts, simplified just enough to keep it fun and easy, yet musically very satisfying. Standard notation, TAB, chords, lyrics, and a chord dictionary are included. Plus, guitar, ukulele, and banjo books with matching arrangements are available---just for fun! Titles: 19th Nervous Breakdown (The Rolling Stones) * As Tears Go By (Marianne Faithfull) * Dedicated Follower of Fashion (The Kinks) * I Saw Her Standing There (The Beatles) * The Kids Are Alright (The Who) * Please Please Me (The Beatles) * (I Can't Get No) Satisfaction (The Rolling Stones) * Shapes of Things (The Yardbirds) * She's Not There (The Zombies) * Tell Her No (The Zombies) * When You Walk in the Room (The Searchers) * You've Got Your Troubles (The Fortunes).